Before owning a home, not many are aware of just how much stuff they will end up accumulating. For homeowners with garages, these are the first go-to alternatives for storage space. But within no time, these garages become filled to the rafters, leaving very little room to pack your car. If you’ve found yourself in such a situation, you should consider getting an outdoor storage shed. Not only will this shed free up your garage but it will also provide you with space to keep outdoor items conveniently and safely. From the very basic, cheap models to mega-impressive and multipurpose sheds, you will have a ton of options to pick from. 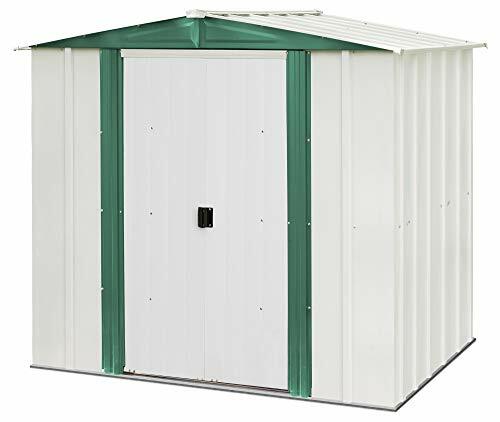 Keter Factor 6 x 3 ft.
Metal : Whether its aluminum or galvanized steel, most metallic storage sheds come with a coating of baked enamel finish, which helps to keep scratches and rust at bay. These shed also come in a wide range of colors and offer unparalleled durability. Vinyl : With this material, you’ll find that most sheds consist of double-wall vinyl panels. The double-wall helps in preventing dents. The panels are usually constructed in precise standards so that they can fit snugly. But the best feature about vinyl storage sheds is that they don’t require any maintenance. Wood : Wood outdoor storage sheds are some of the most popular models. Homeowners prefer this material because it adds a touch of elegance and class. However, be sure to go for a shed made of high-quality wood, which won’t rot or warp. You will come across sheds of varying sizes. When determining what size to go for, first establish your purpose for purchase this storage shed. Small: Small sheds offer storage capacity of less than 80 square feet. These ones are suitable for holding hanging tools or storing simple lawn and garden equipment like fertilizer bags and gas cans. Medium : A medium shed is likely to be between 90 and 12 square feet. Such a shed will be able to hold a couple large-sized garden tools like snow blowers. Large: If you plan to use the shed to store a ton of items, a bigger shed of between 144 to 288 square feet will be ideal. Large sheds can be used to store large tools and even recreational cars. If there’s an extra element you want incorporated in your shed, you should look for it before deciding to buy the shed. For instance, while some sheds come with shelves to ease organizations, others only have shelf brackets. Similarly, if you plan to move wheeled gardening equipment to this storage shed, then a set of ramps will come in handy. Overall, the Lifetime 6446 outdoor storage shed is the best for several reasons. Although it comes with a high price tag, you’ll guaranteed of getting a quality outdoor shed that will serve you for years. First off, this shed has plenty of room to house all your backyard and outdoor tools. Its interior dimensions are 90”wide by 174” deep by 70” high. Secondly, the shed is a low-maintenance one that is constructed using dual wall UV-protected and high-density polyethylene and steel supports. The incorporation of steel into its build make this ultra-durable. Its roof is also pretty strong thanks to the heavy-duty steel trusses. Plus, it’s high-pitched to provide quick and easy drainage of any rain or snow that may accumulate on it. The doors are centrally-placed to provide easy access to either end of the shed. These doors are also lockable, to provide security to the contents you store inside. And, the floor is made of anti-slip material. One thing you should keep in mind though, is that the floor will only be as stable and durable as what is underneath. The manufacturer recommends users to secure the shed using a stable platform before setting it up. With such an anchor, you won’t have to worry about your outdoor shed being blown away by a windstorm. Its design allows ample storage space. The tall entrance and roof are convenient for taller users. Comes with a ton of attachments such as skylights to provide natural lighting. The instructions can be a bit difficult to comprehend. When you buy Lifetime 6446 outdoor shed, you will get six tiny skylights, two polycarbonate windows, which are both shatterproof, 2 screened vents and decorative shutters for the windows. It also comes with two peg strips and two shelves to help you organize your tools. 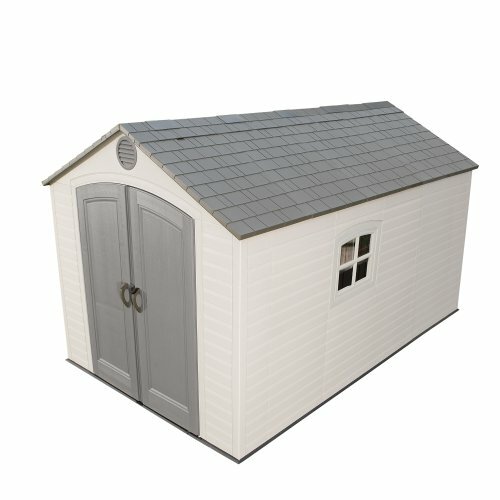 So, for the exorbitant price you pay, you get a durable shed that has all the features you’ll need. Often, homeowners are undecided between building and purchasing an outdoor shed. A few of them are a bit skeptical about going through all the trouble of building one. The Lifetime 6402 outdoor shed is designed for this category of homeowners. It provides quality performance without needing so much assembly and maintenance. In fact, this shed is as good as our top pick. The only difference is that this particular shed comes with fewer attachments. Instead of 6, you get 5 small skylights as well as 2 shatterproof windows, 2 screened vents and just one 90 by 90-inch shelf. Also, the Lifetime 6402 shed is slightly smaller than the first one. This one measures 90” wide by 144” length by 70” high. But like the 6446 shed, it’s also UV-protected and features a high-pitched steel roof to enable quick draining of rain and snow. It’s an all-weather resistant structure. Comes with shatterproof polycarbonate windows. Lockable and steel-reinforced doors to improve security. Also comes with a 10-year warranty. Although cheaper than the first option, this shed is pricier than most other sheds in our review. 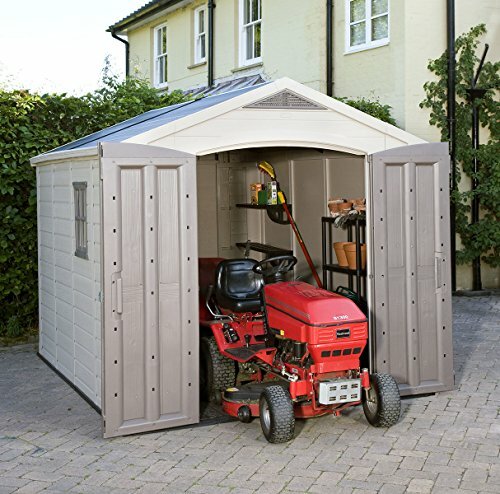 For an outdoor shed that is easy to put up and maintain, you couldn’t go wrong with the Lifetime 6402. It has nearly the same features as our top pick but with a slightly smaller price tag. Going with the more traditional approach, the Keter Factor outdoor shed is constructed mainly using polypropylene resin. So, if you’ve been looking for a resin shed, this is your best bet. Although the resin material decreases the customization options you’d have had by going for wood or plastic, it also offers a couple of benefits. For instance, polypropylene resin is not susceptible to either rotting or decaying as would be the case with wood/plastic composite. Also, maintaining the resin-built outdoor shed is so much easier. All you’ll need to do is to spray the walls with water, and you’re good to go. Another plus of the Keter Factor shed is that it comes with shelving units. It means the need for purchasing such shelves separately or building a few on your own. However, the manufacturer only provides corner shelves, which are not too big. Still, they will be enough to hold a substantial number of items. The external dimensions of this outdoor shed are 10.1”w by 130.5”d by 95.5”h while its internal dimensions are 93.11”w by 122.64”d by 93.9”h. On average, the shed offers a storage capacity of 550 cubic feet. Comes with built-in ventilation system. The roof panels are thin. If you need additional space to store your tools, the 8 by 11 foot Keter Factor outdoor shed will come in handy. It has lockable doors, 3-D tile roofs for ample ventilation and 2 shelves to store those items that cannot be kept on the ground. For those interested in a mid-range, solid storage shed, the Suncast Everett makes a strong contender. It may not have all the bells and whistles, but it’s constructed using sturdy, double-wall resin which won’t rust or rot. The Suncast Everett boasts a metal-reinforced roof that can withstand loads of heavy snow during winter. Plus, it measures 6 by 8’ and has a total storage capacity of 306 cubic feet. Although this is smaller than the Keter Factor, it’s adequate to store a majority of your lawn and gardening equipment. To provide natural light, this outdoor shed comes with windows and skylights. This way, you can navigate the shed without stumbling over tools. This Suncast Everett gives you the ultimate experience when it comes to outdoor organization. It’s a basic structure that does not require a lot of maintenance, yet it provides plenty of room to store your tools. Have you been looking for a storage shed that you can use both outdoors and indoors? 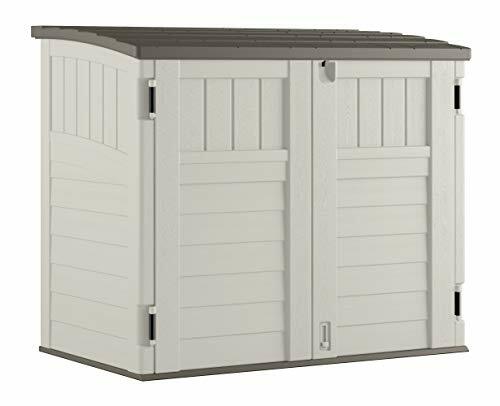 If you have, the Suncast BMS8400D is the perfect storage shed for you. 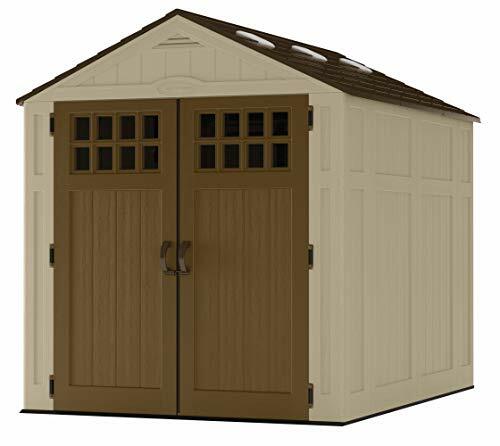 The Suncast Tremont is a large shed measuring 8 ft. by 10ft. boasting a storage capacity of 574 cubic feet. Its doors and windows are of a big size, a factor that makes it easy to move and store large-sized items in the shed. This shed is made of blow molded resin, which is both durable and strong. And the best part is that resin is an easy-to-clean material so you don’t have to worry about spending too much time on its maintenance. The roof is also constructed using resin, and then reinforced using metal truss. Also added to the roof are six skylights to let in natural lighting into the shed. Ideal for keeping long-handled tools and garden equipment. Allows easy access to large tools. Requires users to construct a foundation. No materials for its assembly are included. The Suncast storage shed is designed for homeowners looking for versatility. If you’ve ever needed to expand your storage space both indoors and outdoors, then this shed by Suncast will serve you well. For an individual who wants something a bit fancy, the Keter Factor Resin outdoor shed will not disappoint. 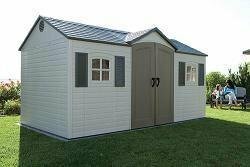 This storage shed is similar to the Keter Factor shed we reviewed earlier, but it has a more compact size; hence looks more stylish. This outdoor shed measures 6ft. by 3ft. and is a great fit if you want something that complements the look of your home. The Keter Factor boasts a wood-like texture in neutral colors, which is bound to match with any home’s exterior. However, this shed has a lot more to offer than its curb appeal. 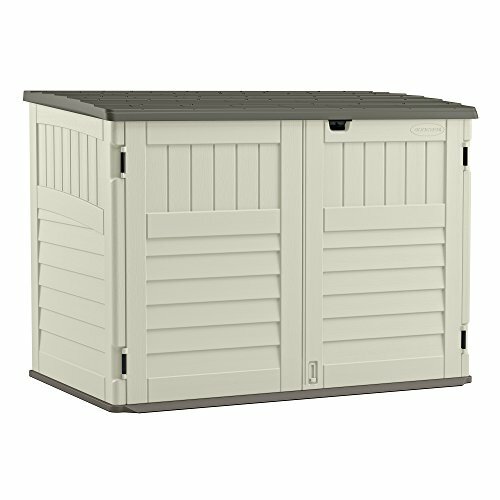 With interior dimensions of 63.86” by 39.17” by 78.74”, this shed offers a substantial storage capacity of 113 cubic feet. Overall, the shed has been constructed using resin plastic and steel to guarantee durability. Lockable to provide additional security. Comes with 3-D tile roof for ventilation. Includes shelf brackets so that you can add your own shelves. Has skylights to allow light. Does not come with shelves. The Keter Factor 6ft. by 3ft. is made for the fashion-conscious homeowner. It features an elegant wood-like texture in beige color, which blends well with just about any exterior décor. Some homeowners may want to invest in outdoor storage sheds but lack enough space in their yard to set one up. If you sail in this boat, the Keter Manor is the ultimate solution. This shed has a vertical design, which helps to save on space. The benefits of the Keter Manor are apparent from its narrow yet tall frame. Measuring 4ft by 6ft. this shed is the perfect choice for tighter confines. Now, gardeners across the globe can bring style and function even in limited spaces. Another plus of this shed involves the double wall panels that have been extruded to provide durability. Plus, they’re made of weather-resistant materials. Even though the doors look attractive, the one feature that will grab your attention is the shed’s floor. The floor consists of built-in ventilation ducts to ensure that there is as much circulation as possible. The tall frame means that you can stack more items. The floor has built-in ventilation. Does not have any windows so you have to add your own lighting fixtures. Having a small yard or garden space should not restrict you from keeping your tools organized. The Keter Manor features a compact but tall frame, which can fit well in confined spaces. Suncast BMS4700 is a low-profile outdoor shed. It’s uniquely constructed for homeowners who want storage sheds with minimalist designs. This is an outdoor storage shed that lies below the standard 6-foot fence, meaning that it’s not likely to attract any attention. The Suncast BMS4700 provides homeowners with a highly-organized unit for storing away yard clutter. With a quality shed like this, you won’t have to take your occasional barbecue grill to the attic anymore. Also, the shed is ideal for storing away several bikes; hence enabling you to protect them from harsh weather. Suncast BMS4700 weighs a measly 125 pounds. This makes it lightweight enough to carry around in case you have to relocate or want to place in a different spot. In total, the shed has a storage capacity of 70 cubic feet and it can fit two 96-gallon garbage containers. Can protect your tools and items from sun and moisture. For a simple, light but functional storage shed, this model by Suncast checks all the boxes. This storage shed provides a long-lasting performance and it requires only minimal maintenance. Many homeowners are torn when it comes to choosing a material for their outdoor storage sheds. While wood gives the shed an elegant look, it might rot over time, especially if it’s not quality wood. Plastic, on the other hand, is easy to maintain but sometimes not durable. If you’ve found yourself in such a situation, worry not. The Arrow Shed HM65, which is made entirely of steel, overcomes the shortcomings of wood and plastic sheds. One thing you will notice about the all-steel HM65 shed is that it’s much cheaper than its counterparts, which are constructed using wood or resin. For less amount, you will get a spacious and quality outdoor shed to store your tools. Another benefit of the steel construction is that it’s easier to assemble. It comes with pre-cut and pre-dilled parts that make its assembly a cinch. Also, the steel construction makes this shed one of the most durable in our review. Steel is one material that is not prone to damage or breakage. Has mid-wall brace to provide all-round strength. The included screws are not the best. The Arrow Shed is another ideal choice for an outdoor shed. Unlike most sheds that are made of either resin or wood, this one is made exclusively from steel; thus, offering unmatched durability. 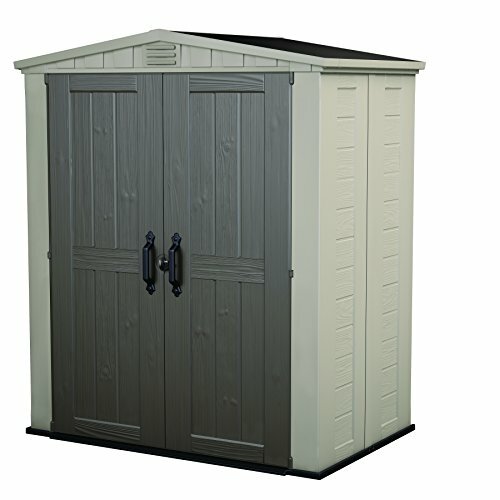 The Suncast BMS2500 shed is designed to ensure that even those with limited budgets can still keep their garden equipment, camping gear and tools well-organized. A majority of homeowners shy away from purchasing outdoor sheds because they regard them a luxury. But this is not the case with Suncast BMS2500, which is one of the most affordably-priced outdoor storage sheds. What’s more, the shed offers the best security thanks to its 3-door locking system. It also comes with an easy-lift lid with front double-door accessibility. Measuring 4ft. by 2ft. by 3ft. this shed has plenty of room for storing garbage cans, lawn care tools, bicycles, snow blowers and more. Has a multi-wall resin construction for easy maintenance. Reinforced floor to support heavy equipment. Lacks shelves for better organization. 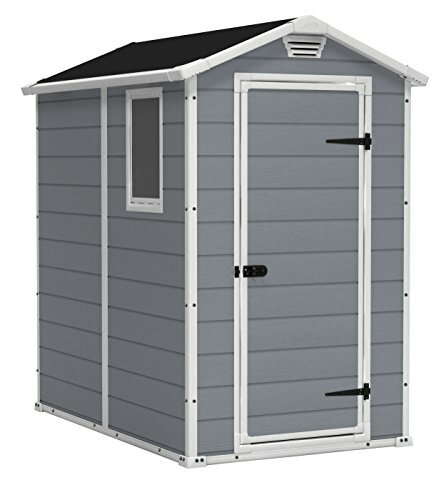 Overall, Suncast BMS2500 is an inexpensive yet functional outdoor shed. If you were not planning to spend a chunk of money on this item, this outdoor shed is an excellent option. We evaluated more than a dozen outdoor storage sheds- including small, medium and large-sized ones. We narrowed down our list to 15 storage sheds, which we tested by fitting different sized tools, bicycles and garbage containers. We then compared the different sheds based on storage space, materials used in their construction, durability and availability of other features. We also did an in-depth research on the features that most customers look for when buying outdoor storage sheds. For most people, the Lifetime 6446 Outdoor Storage Shed checked all the right boxes. Even though it was pricey, the amount of storage space, performance and durability that it offers, outweigh the upfront cost. Of course you can choose any of the other top-rated sheds in our review as they also perform well, but they may not have some accessories like shelves. Having an outdoor storage shed in your backyard is always a prudent idea. The best outdoor storage shed will be easy to assemble, be made of quality materials and have accessories to meet your needs. In our testing, we found the Lifetime 6446 to be the storage shed for several reasons. For starters, it offers plenty of storage room. Secondly, it comes with skylights, which let in natural lighting into your shed. And, it comes with shelves, which are handy for storing items that shouldn’t be placed on the ground.